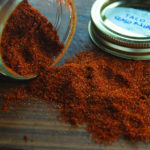 Homemade taco seasoning is so easy to make and lets you control exactly what goes in and what the spice level is like! Take 5 minutes and throw it together. I use about 3 tablespoons of mix per pound of meat. Start with 1 tablespoon and taste as you go to see how you like it.